Every time you look at Trove, there is something new to discover from newspaper publications coming online through to new photographs being indexed. Photographs can be searched from the main Trove homepage, or via the Trove Pictures, photos, object homepage. With it's roots formed from the National Library of Australia's discovery service Picture Australia back in 2000, the service has now been absorbed by and included as one of the treasures of Trove. A total of 7,208,209 items are indexed in this fabulous section of Trove. Contemporary images are also indexed from the Flickr group Trove: Australia in Pictures which, at the time of writing this blog post, contained some 162,065 images. The daughter of John Mills and Agnes Warburton, Susannah was born 3 January 1855 in Accrington LAN ENG. On 12 December 1880, Susannah married coal miner come engine keeper John Livingston Auld at the St James Church in Accrington. At the time of the 1881 English census on 3 April, Susannah Auld was listed with her new husband living at 9 Hope Street Accrington, having an occupation of cotton weaver. 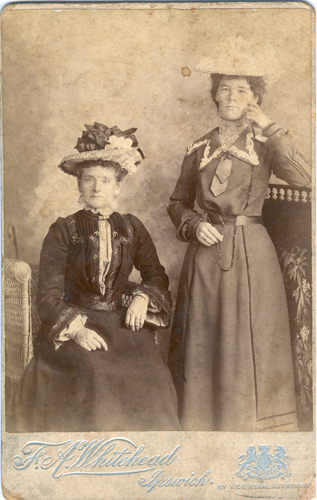 Interestingly the studio that took the photograph of Susannah and Agnes Auld, F.A. Whitehead of Ipswich, is still operational and can be found online at Whitehead Studios. According to Alan Davies’ and Peter Stanbury’s book The mechanical eye in Australia: photography 1841-1900, Francis Arnold Whitehead started his photography business in Ellensborough Street Ipswich in 1883. He carried on at this address until 1889, at which point he moved to Brisbane Street in Ipswich. Historic images from the Whitehead Studios are being digitised by Ipswich Library and will be made available through their Picture Ipswich collection.